There will be partly cloudy skies over the city today and tonight. The high will reach 81° with the low tonight near 63°. The Pennsylvania Railroad has proudly announced that 1,481 women were added to its workforce in June. The ladies are taking the places of railroad men who have gone to war. Excluding office work there are now 8,354 women working for the railroad in occupations formerly held by men. Denis J. Dougherty was installed as Archbishop of the Diocese of Philadelphia this morning at the Cathedral of Saints Peter and Paul. The great edifice was filled to overflowing with prelates, priests and thousands of the faithful all there to witness the solemn event. Thousands of those that could not get into the Cathedral stood along the sidewalks and in Logan Square following the ceremony as best they could and joining in with the prayers of the Mass. 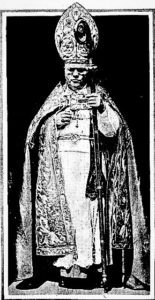 Archbishop Dougherty was attired in vestments of gold. He wore a white miter which was also embroidered in gold and studded with aquamarines and turquoises. The ceremony was officiated by Cardinal James Gibbons, Archbishop of Baltimore and primate of the Catholic Church in America. It began with a procession of priests, monsignors and Bishops. The new Archbishop entered last as a choir of seminarians sang “Ecce Sacerdos Magnus” or “Behold the Great Priest”. When the Archbishop reached the altar the Papal Bull which announced his formal enthronement was read followed by a Mass. Archbishop Dougherty is a Pennsylvania man. He was born in Ashland in Schuylkill County and is described by those who know him as a man of great intelligence, modesty and humility. The Archbishop is now entrusted with the spiritual well-being of this city’s 700,000 Catholics, 800 priests, over 300 churches and 90,000 children in the Catholic schools. There are reports from Rome that the Kaiser has left the front in France to return home. The reason it is thought is that the Kaiser has caught the Spanish grip or influenza. It is also reported that several members of his family are also inflicted with the disease. In Flanders the Germans are conducting a continuous ferocious artillery bombardment of British positions. And in the region of Amiens there is also heavy German artillery and machine gun fire directed at British positions. On the Marne front, the American positions around Chateau-Thierry have been unusually quiet. Some believe that this could be the prelude to a major German assault. Today’s casualty list contains 108 names on both the Army and Marine lists. The army lists 21 killed in action, 15 died of wounds, 4 dead from disease, 3 dead from accident, 45 wounded severely, 1 wounded slightly, 12 missing in action and 2 taken prisoner. The Marines list 2 killed in action, 2 dead from wounds received in action and 1 wounded severely. One of those listed as dead from wounds received in battle is Private Harry Levin of 515 Fairmount Avenue. He was wounded in battle on June 13. Private Levin was serving with the 60th Infantry and had only been in France for 7 weeks when he was wounded. His father, Peter, has also been wounded fighting the Germans in Russia. Peter Levin’s present condition is unknown.